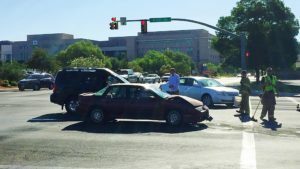 ST. GEORGE — Two vehicles smashed into each other at the intersection of 700 South and River Road in St. George Tuesday morning when one of the drivers allegedly failed to obey the traffic signal. At approximately 8:57 a.m., a woman driving a 1994 Saturn SL2 stopped in the left-turn lane on River Road at a red light. 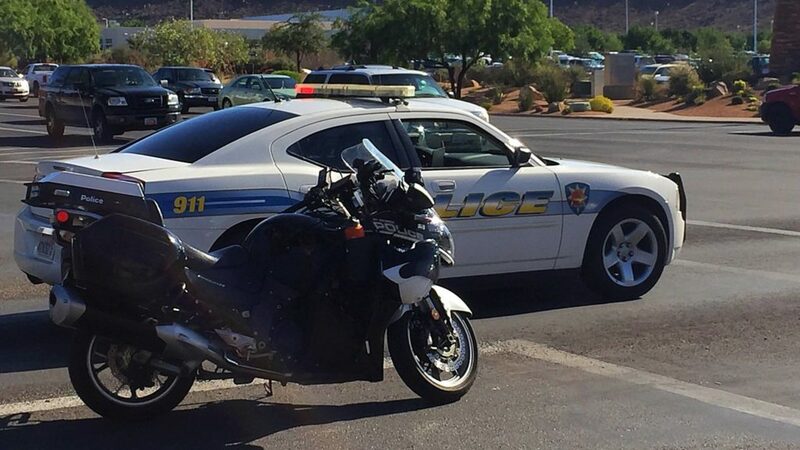 The woman was preparing to turn onto 700 South, St. George Police Officer Jamison Hale said. The driver of the Saturn received a green arrow, but as she proceeded to make her left turn, Hale said, a woman traveling south on River Road in a black 2011 Nissan Xterra continued driving through the intersection. The two vehicles collided in the middle of the intersection, spinning the Saturn around. 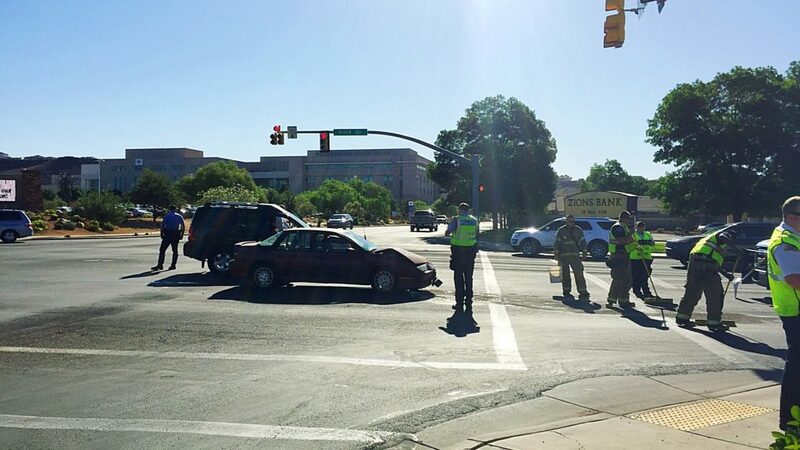 The woman driving the Nissan complained of pain in her neck and left arm, Hale said, but declined ambulance transport to the hospital — conveniently located at the corner of the intersection. No other injuries were reported as a result of the collision, Hale said. 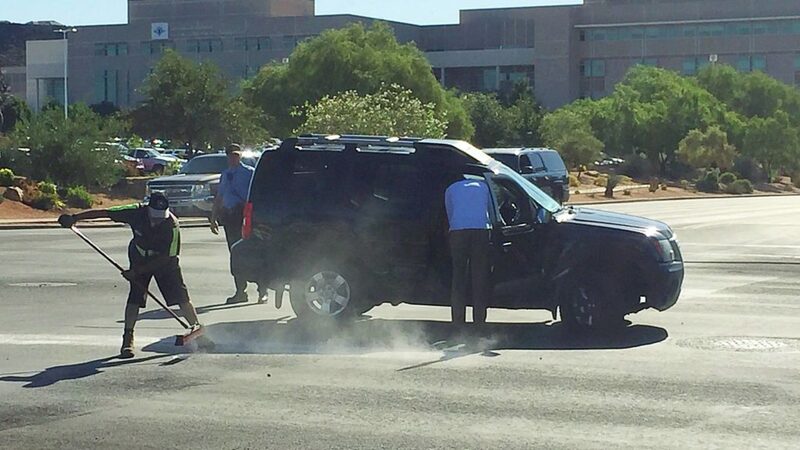 Both of the vehicles were rendered inoperable during the crash and were towed from the scene. 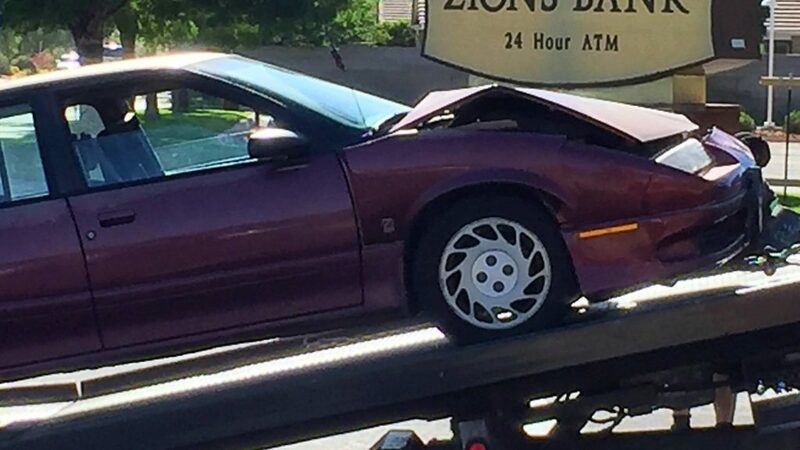 The driver of the Nissan was issued a citation for failing to obey the traffic signal, Hale said. St. George Police, St. George Fire and Gold Cross Ambulance responded to the crash. The left southbound lane of River Road was closed as responders tended to the scene.